Commercial Painting Services is an Industrial Concrete Polishing Contractor that does work in Kalamazoo, Michigan, and for all of Oakland County. Our concrete grinding staff is very well-versed in polishing concrete. We have over 15 years experience and have perfected our grinding process. We use only the best concrete grinding machinery that money can buy (Husqvarna), and these machines polish concrete to perfection. Whether you’re after a high gloss finish for your facility or are simply looking for a concrete leveling contractor, consider calling us today. All our work is guaranteed and we pride ourselves within the quality of our work and for completing projects on schedule. We’ll work hard to earn your repeat business! Q: How durable is Polished Concrete? A: Polished Concrete increases impact and abrasion resistance for an aesthetically pleasing, stable, long-term option to rejuvenate your existing floor. Our process of concrete densification and impregnation makes your floor almost bulletproof. Polished Concrete is recognized by The National Floor Safety Institute as a “High Traction Floor”. Polished Concrete offers excellent Anti-Slip Resistance, especially when compared to an Epoxy or Commercial Tiled floor system. A: Polished Concrete is absolutely beautiful and delivers a glossy, mirror-like finish. We offer different levels of sheen to deliver the exact look that you intend. The high-gloss can look like a floor that has been waxed 10 times! We also offer custom dye coloring, your custom logo saw cut into the concrete, patterns, and many other creative ideas to help bring your vision to life. Q: Is Polished Concrete Cost Effective? A: You may be here because you already know that Concrete Polishing is an economical choice. There is no need to replace your existing floor with our system, simply rejuvenate your existing flooring! Your new Polished Concrete will not require any costly sealers or wax applications moving forward. There are no reapplications, coatings,or repairs. Polished Concrete can either be wet or dry mopped but, waxing will no longer needed to maintain the beautiful sheen you get with Polished Concrete. Q: Are Polished Concrete Floors Difficult to Maintain? A: Your new Polished Concrete floor(s) will simply require dry mopping and wet mopping to keep it clean and can withstand most chemicals to draw out some of the more heavier topical staining that you may have. Q: Is Polishing Concrete Easy on the Enviroment? A: Commercial & Industrial Leed Credits are likely available through The American Institute of Architects for your new Polished Concrete Floor. The AIA recognizes Polished Concrete as a “Sustainable Flooring”. For more information regarding your Leed Credits within your next project, click here. Q: Can we customize the look of Polished Concrete? 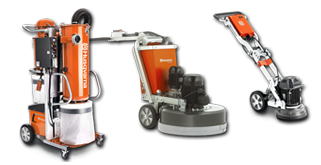 Use our automated Quote System | Visit our Commercial / Industrial Concrete Polishing Page.